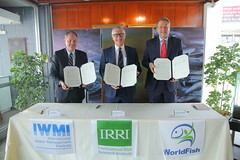 LOS BANOS LAGUNA – The International Rice Research Institute (IRRI), WorldFish, and the International Water Management Institute (IWMI) signed a five-year tripartite Memorandum of Understanding (MoU) today. 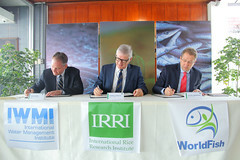 The agreement provides a framework for cooperation on research for development (R4D) initiatives focused on the sustainable intensification and management of rice-fish production systems in irrigated landscapes and wetlands in Southeast Asia. “What we aim to achieve as individual organizations is interconnected and geared toward the fulfillment of almost the same SDGs. We envision a sustainable food, nutrition, and water secure world and this strategic partnership gets us closer to that goal,” said IMWI Deputy Director General - Research for Development, Mark Smith.